Bo Nonn contemplates the Clarno Unit Palisades while Sheila listens to Bill Orr’s discussion. Photo by author. Early afternoon Friday 9/14/18, GSOC field trip participants assembled in the picnic area beside the Clarno Palisades. They took a short hike with fellow participant Dr. William Orr to examine the structure of the Palisades and the fossils found within the rock. 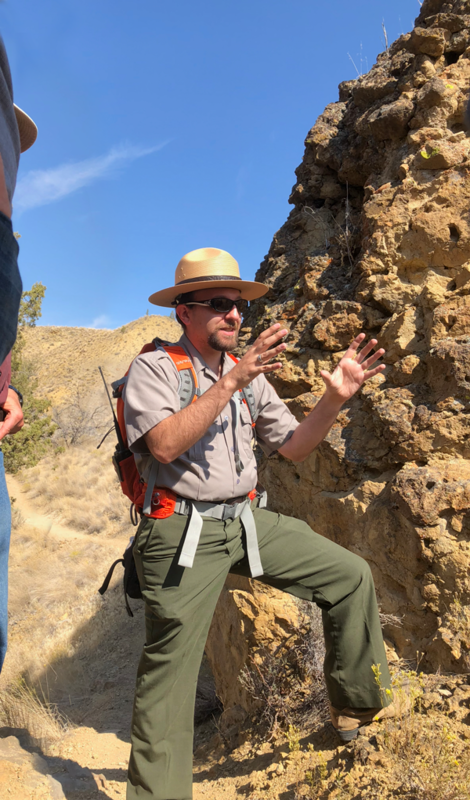 Orr explained that the Clarno Palisades are composed of cool lahar flows that did not destroy the integrity of the plants and animal bodies they overran. The layers have little “attitude” which means they have not been tilted during or after emplacement. They are 45-50 Ma in age. Although the porosity (% holes) in this rock is 4-5%, the permeability is very low because the holes aren’t connected. Bill explains lahars. Photo by Paul Edison-Lahm. Orr underlined two important facts about this deposit: (1) The lahar deposit shows us that fossils can be preserved in “volcanic rocks,” (2) but these are sedimentary rocks, aren’t they? They are essentially the equivalent of a landslide deposit. Oregon was the “Pittsburgh of the West” because it had low grade iron ore in some of the soils of the area. Grillwork famous in the city of San Francisco prior to the earthquake and fire was from iron from Oregon. 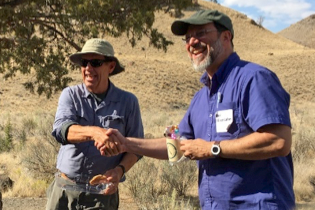 After the short hike and interpretation in the Clarno Palisades, the GSOC participants rendezvoused back to the picnic area to meeting with the Central Oregon Geoscience Society members who were just finishing their hike in the JDNM Clarno Unit. Trip leaders Bob Timmer and Derek Loeb met with GSOC President Paul Edison-Lahm and Paul presented them and their participants gifts of GSOC mugs filled with trail mix that GSOC had put together to welcome our recently formed sister club COGS. Welcome to Camp Hancock! Photo by Patty Hyatt. 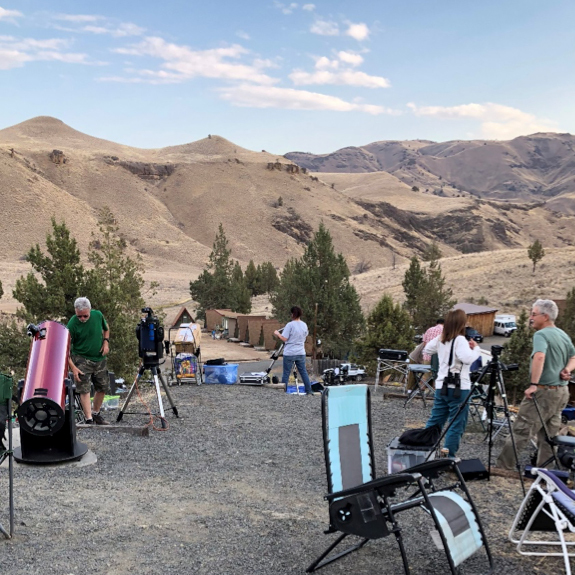 After relocating down the road at historic Camp Hancock, participants moved into their bunks and prepared to spend the evening with the Rose City Astronomers at their biennial Hancock Star Party. This was an exciting event not only for its foray into the sister science of astronomy, but also historically, as the founder of Camp Hancock, Lon Hancock, was a GSOC Past President and GSOC was involved in the foundation of OMSI. Yara Green of RCA spoke to the GSOCers after dinner, explaining the viewing protocols and taking us on a grand tour of the sights we would be likely viewing that evening — sprinkled with fascinating facts about astronomy and the vast structure of the cosmos. RCA members prepare their scopes for evening viewing. Photo by Megan Faust. That evening GSOC participants went to the “star ambassador site” near the Camp Hancock parking area to view with the RCA Star Ambassadors Kelsey Yocum, Bhavesh Parekh, Mark Lowenthal, John DeLacy, David Novotny and Jennifer Laster. Kelsey Yocum gave a quick tour through the sky with a powerful laser pointer. Carol Hasenberg’s account of the star party was this: “The night was very beautiful, and stars were out full force. The moon was a waxing crescent and moonset was 10:22 pm. Our star host started by using a powerful hand laser to show us around the sky. The most prominent constellations and other objects visible were the Big Dipper, Cassiopeia, the Summer Triangle, and Sagittarius, and the planets Mars, Saturn and Jupiter. “She then showed us quite a few features in her telescope, including the moon, Jupiter, Saturn, Mars, M31 the Andromeda Galaxy in the constellation Andromeda, M13 the Great Globular Cluster in Hercules, which was one of several globular star clusters, several open clusters of stars, and M57, the Ring Nebula in Lyra, one of several nebulae. We also saw M27 the Dumbbell Nebula in Vulpecula. RCA Star Ambassador Kelsey Yocum enjoys some geology at the Hancock Tree. Photo by Paul. There were two hikes planned on the “geoloop” trail of the Clarno Unit of JDNM for Saturday. These were on an unofficial national monument trail, so special permission and a guide were required. 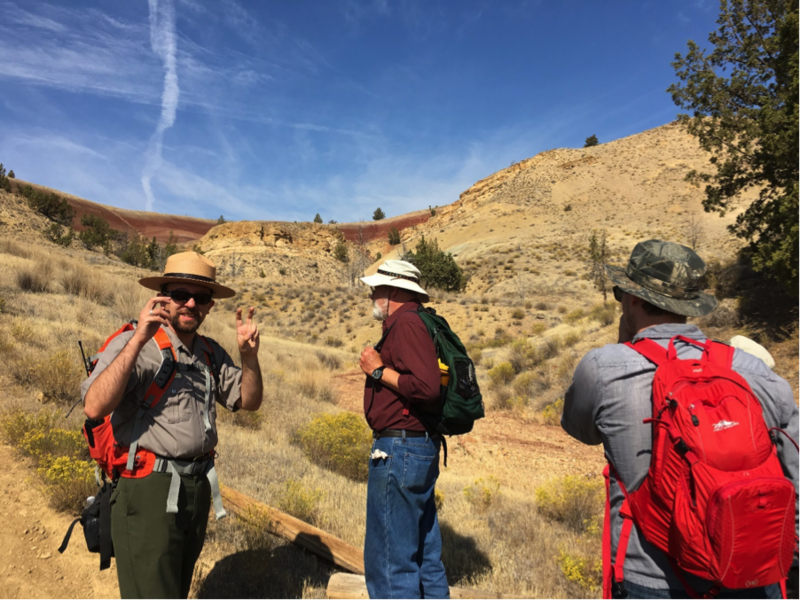 One hike was NNW to the famous Clarno Nut Beds on the slopes of Red Hill, which demonstrates the red paleosols that developed in the subtropical climate of the Eocene. This hike was led by NPS Paleontologist Dr. Nick Famoso. The other hike, led by Dr. Bill Orr, was a longer trek NE to Hancock Canyon and the Hancock Tree, a preserved tree trunk belonging to a species related to today’s katsura tree of Asia. Forty people went on the hikes, and since there were only 22 GSOC participants (in addition to Dr. Orr), then the rest of the hikers were RCA people. We applaud their enthusiasm for the geosciences. Dr. Famoso discusses the lahar deposits. Photo by Paul. Notes on Nick Famoso’s Red Hill Hike: first of all, we needed to get the rules straight – leave all fossils and archaeology objects in situ! If you find a noteworthy fossil lying on the ground, get its GPS coordinates and photo and tell some of the park personnel. Famoso was familiar with Camp Hancock as he spent six years as a camp worker in his younger days. The John Day Fossil Beds National Monument (JDNM) was not created by Presidential decree; it was created through an act of Congress. The nut beds and mammal quarry were not part of the original park but were added at a later date. On the way up to the nut beds, the hikers walked through other outcrops of the lahar deposits of the Clarno, similar to the Clarno Palisades elsewhere in the park. The nut beds are high up against the backdrop of Red Hill, whose dark red surface showcases the paleosols created by the weathering in the subtropical environment of the Eocene era 40-44 Ma. Many of the nuts, subtropical flora, insects and vertebrate fossils were found in the boulders that have fallen off the nut bed outcrop. NPS Paleontologist Nick Famoso explains with air quotes and the Clarno Nut Beds in the backdrop. Jon Stroud and Madison Ball are listening. Photo by author. The paleosols of Red Hill. Photo by author. The Mammal Quarry. Photo by Barbara Stroud. The top of a hill in the distance is crowned by the John Day Member A Ignimbrite (welded tuff). Two ridges over from the nut beds one finds the mammal quarry. As the deposit from a point bar in a stream, this area collected the unarticulated bones of many animals and contains very few plants. Age is 40 Ma and it is located at the very top of the Clarno Formation. 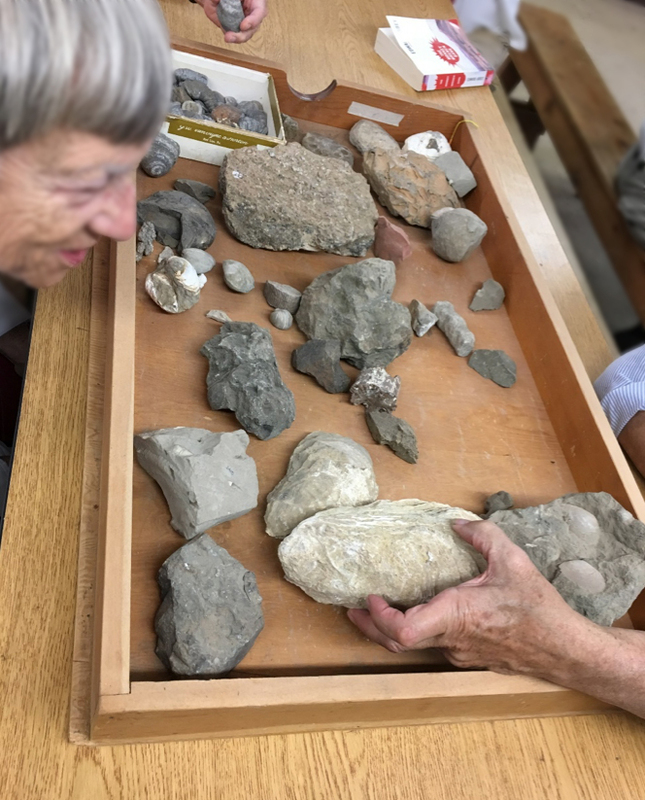 Nancy Overpeck inspects one of the fossils in the lab. Photo by author. #1 Fossil ID Session in Lon’s Lab: Bill did not actually ID any fossils in this learning session, I imagine because most of us would not have known the difference anyway and would have been lost in all the latin names. Instead, he discussed fossils in a “teaching collection” such as the one found in Lon Hancock’s laboratory. In setting up a fossil teaching collection, Orr said that it is important to bear in mind that fossils can break if you drop them, so don’t put your museum specimens in the lab. It’s not necessary to have a perfect specimen to give you important info about the animal and its environment. It’s also not necessary to have a whole skeleton of the animal. For example, fish fossils are rarely found as articulated skeletons. But you don’t need an entire skeleton as fish can easily be identified by their scales, so you just need one scale. These parataxons can represent an entire organism and many such bits (teeth, scales, ossicles, etc.) are used in paleontology. Repeating patterns are often found on both plants and animals and can be used to identify species. Some examples are trilobite segments, ammonite suture patterns, leaf veining patterns, etc. 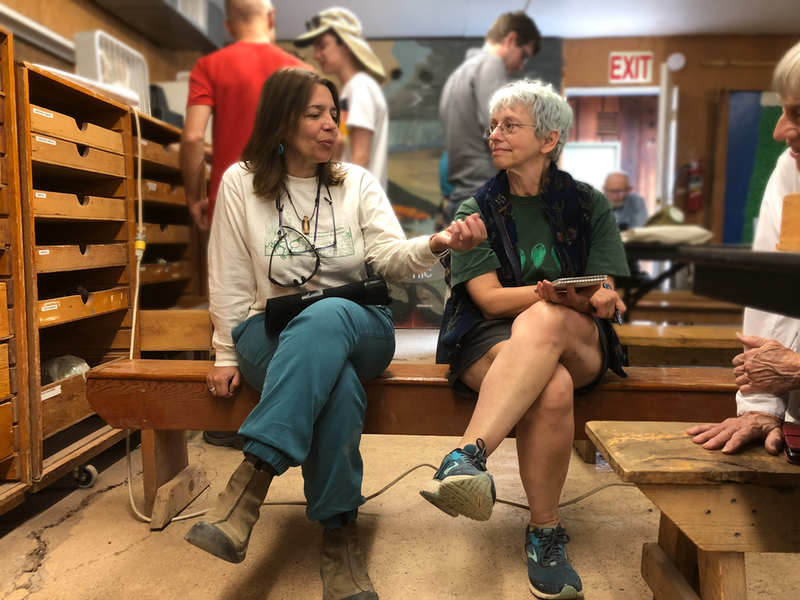 Board members Dawn Nilson (RCA) and Carol Hasenberg (GSOC) gather in Lon’s Lab for Orr’s Fossil ID session. Photo by Paul. This brings us to the concept of guide fossils, which are the stock in trade for paleontologists. Guide fossils are those remains of ubiquitous creatures that can be used to determine the relative age of any strata. To qualify as a guide fossil, the animal type must be found just about everywhere in the type of strata you’re in, so it must be able to get around easily (ie., it flies or swims), it must have big populations and it must be able to evolve rapidly so your time frame can be pinpointed. It must also be easily identified from closely related populations. Orr used the example of rodents – they evolve quickly and all you need to identify the species is the cheek teeth. Plant fossils in general do not make good guide fossils because they evolve slowly. Many of these guide fossils are tiny microfossils. Identifying them is not as difficult as you might suppose and can often be done in the field with a 10x lens. They might first have to be extracted from the parent rock by some means (boiling, processing with acid, etc.). Additional Reading: “Thomas Condon’s Fossils,” synopsis by the Friday Night Lecture by Bill Orr in The Geological Newsletter, July/August 2017, Volume 83, Number 4. 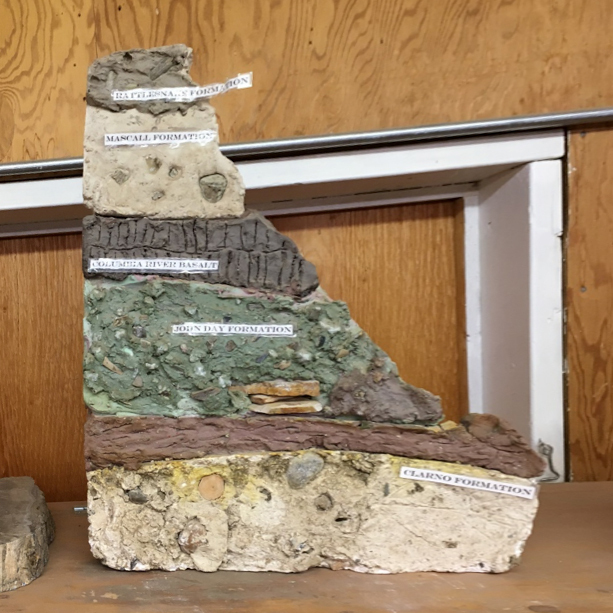 This model of the stratigraphy of the JDNM was found in Lon’s Lab. Photo by author. 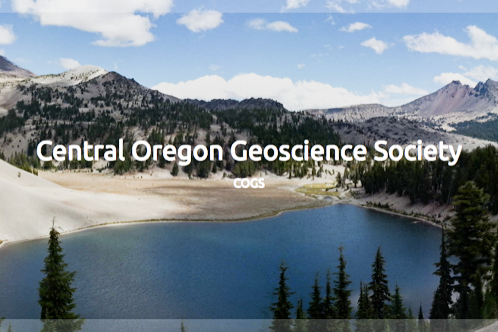 Bill began the evening lecture by describing the geophysical Blue Mountain province of Oregon as being one of rich geology. The Blue Mountain area contains the remains of a number of exotic terranes which were brought to Oregon with the tectonic ocean crust conveyor belt. Forty years ago, geologists became aware of the fact that there were exotic Asiatic fossils in Oregon, and thus the idea behind the terranes was formed. Younger Tertiary rocks are then draped over top of these exotic terranes. There is a rich record of these Tertiary deposits starting from about 50 Ma in age with the Clarno Formation of the Eocene Epoch, John Day Formation in the Oligocene, Picture Gorge Basalt and the Mascall Formation in the Miocene, and the Rattlesnake Formation in the late Miocene. Fortunately for the nearly continuous record of the flora and fauna of the day, a lot of volcanic ash was erupted in the area during this time, and this is an optimum preservation medium. Many articulated skeletons were found of a wide-ranging diversity of species, both large and small. In addition to animals there were many plant fossils representative of the total environment. The environmental record of the fossils shows that there were two major climatic changes in the area. The first is that of a cooling trend at the boundary of the Eocene and the Oligocene, and this corresponds to a world-wide cooling trend in the fossil record. In addition, a further cooling and drying trend is noted which corresponds to the rise of the Cascade Mountains in Oregon, creating a rain shadow over the land to the east of this barrier. Lon Hancock, GSOC President of 1945. GSOC Archive photo. The first paleontologist in the area was Thomas Condon, a missionary minister who eventually went on the become the first Oregon State Geologist and professor of Geology at the University of Oregon. Prominent paleontologists of the nineteenth century, Othniel Marsh and Edward Drinker Cope were intrigued by the fossils Condon was finding and sent delegations out to collect and publish findings. 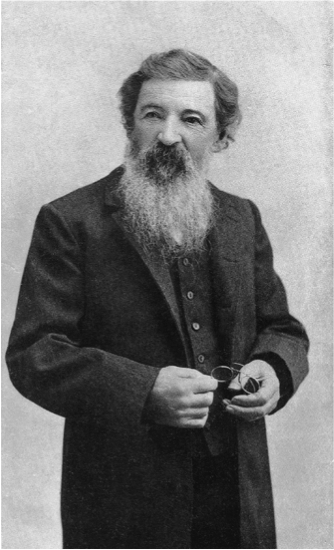 John Merriam from UC Berkeley began introducing contextual methods of fossil collecting at the close of the nineteenth century. Earl Packard replaced Condon at the University of Oregon. A group of four paleontologists including Merriam and Chester Stock, dubbed “The Associates,” studied fossils in the area and began to lobby for the protection of the fossil beds. But the area did not receive official status until 1975. Orr described the geology of the fossil beds and the “greatest hits” of creatures found there. The Clarno Epoch had a warm, humid climate and produced animals that would be comfortable in a subtropical forest. Hemipsalodon was a super predator that looked much like a hyena. This creature feasted on early members of the horse family, oreodonts, and other mammals of the time. Orr did not dwell on the fauna of the Clarno, although the remains of vertebrates found at the nearby Mammal Quarry were from that time. He then described the John Day Formation, which began with the Big Basin Member, in which soil layers developed on top of volcanic ash, and the colors that developed as the soils weathered mark rainfall variations that occurred as the climate changed over the years. The most dramatic exposures of these are at the Painted Hills Unit of the monument. Big Basin exposures are rich in plant remains. The Turtle Cove Member, with its greenish layers of volcanic ash, is punctuated by a marker bed of welded tuff, known as the Picture Gorge Ignimbrite. Although this layer contains no fossils as it fried everything in its path, the surrounding layers of the Turtle Cove Member are most productive in fossils. A common super predator of the day is the Entelodont Archaeotherium caninus, nicknamed the “terminator pig”. A favorite of Orr’s were the Chalicotheres, cousins of horses and rhinos, which had clawed feet and a long tall neck. Hypertragulids were deer-like creatures with canines. They were very common. Another common mammal was the browser Oreodonts. Hundreds of these were collected by Thomas Condon. The group is dwarfed by the spectacular Turtle Cove Formation on Sunday’s Blue Basin hike. Photo by author. The environment that produced the Turtle Cove mammals was that of a tropical savannah like we see in East Africa today. A primate lived in this area with the difficult-to-pronounce moniker of Ekgmowechashala, taken from the Sioux language for “cat with the face of a man.” Both camels and rhinos lived and evolved in this environment. Small rodents – many and with huge populations – evolved rapidly and have been easy to identify (by their cheek teeth), have been used as guide fossils as described in Orr’s afternoon lecture. Originally and for many years, geologists had assumed it was the Cascades Mountains that produced the vast ash deposits that became the John Day Formation, but in the twenty-first century it was a team of geologists from DOGAMI led by Mark Ferns and Jason McClaughry that found three monster calderas further east and published their finds in 2006. These are the Wildcat Mountain Caldera, erupting in the Eocene, the giant Crooked River Caldera in which the town of Prineville is centered, and the Tower Mountain Caldera. One of the most famous groups of fossils found by Thomas Condon depict the evolution of the horse. He found three “missing links” in horse evolution, including Merychippus of the Miocene. After the vast eruptions of the Picture Gorge Basalt, fossils continued to be laid down in younger falls of ash, although not at a rate as in the Clarno and John Day Formations. The Mascall Formation of 15 Ma was studied by geologist Chester Stock, who also worked at the La Brea tar pits in California. Its tan to buff layers contain a good diversity of fossils. The Rattlesnake Formation, which contains the famous Rattlesnake Tuff, contains rather familiar types of mammals from about 7 Ma. Horses, camels, and rhinos were preserved by a series of eruptions whose sources are younger as they go westward. The 2018 GSOC President’s Field Trip Participants pause for a photo on the porch at OPLI. First row from left Barbara Stroud, Nancy Overpeck, Paul Edison-Lahm, Dennis Chamberlin, Charlie Montross, Patty Hyatt. Second row Mark Anderson, Jan Kessler, Christina Bennett, Julia Lanning. Third row Bo Nonn, Barbara Smoody, Larry Jordan, Sheila Alfsen, Ann McKinney, Larry Purchase. Fourth row Herb Dirksen, Jon Stroud, Bill Orr, Fennella Robinson, John Scott, Bill Stein, Madison Ball, Megan Faust, Karyn Patridge. Photo by author. Sunday field trip began with a visit to the Oregon Paleo Lands Institute (OPLI). A volunteer at OPLI, Karen Massau, welcomed the GSOC participants. She showed the crowd some of the exhibits housed at the museum, particularly the Mitchell Plesiosaur, a find in which the lower jaw and part of the skull were recovered. Fossil cast is in Mitchell at the BLM office. Finding the plesiosaur reinforced the idea that there were oceanic remnants brought here to Oregon (the Cretaceous Hudspeth Formation). OPLI decided to make the plesiosaur their main theme. Also, the Wheeler High School fossils have been popular activities for amateur geologists in the past. They were formed in a lacustrine environment. 32.5 Ma, which was subjected to repeated ashfalls. This activity is located in the town of Fossil, although this field trip did not go. A fee is charged for fossil hunting. Karyn Patridge talks about the stratigraphy in the Foree section of the JDNM. Photo by Paul. Guest field trip speaker Karyn Patridge spoke to the GSOC field trip about her interest in the volcanism of the John Day formation. 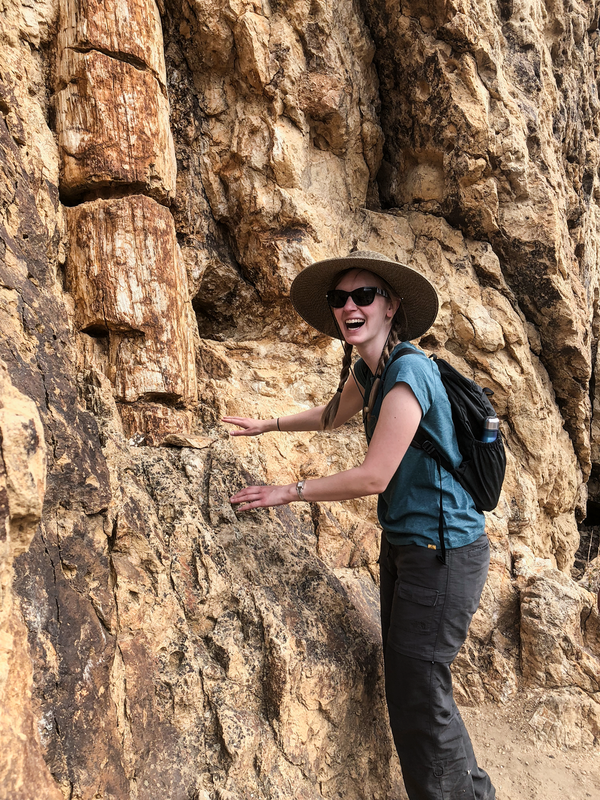 Karyn’s work involves determining the source of the Picture Gorge Ignimbrite and determining whether the source of the magma is the subduction zone environment or whether the chemical signature is more consistent to hot spot volcanism. Karyn took samples from the four possible known candidates of John Day volcanism and compared their geochemical signatures to the Picture Gorge Ignimbrite. These were the Wildcat Mountain Caldera (a bit too old at 40 Ma), the Tower Mountain Caldera (32 Ma), the Crooked River Caldera (32-28 Ma), and the Mohawk River Caldera (32 Ma). 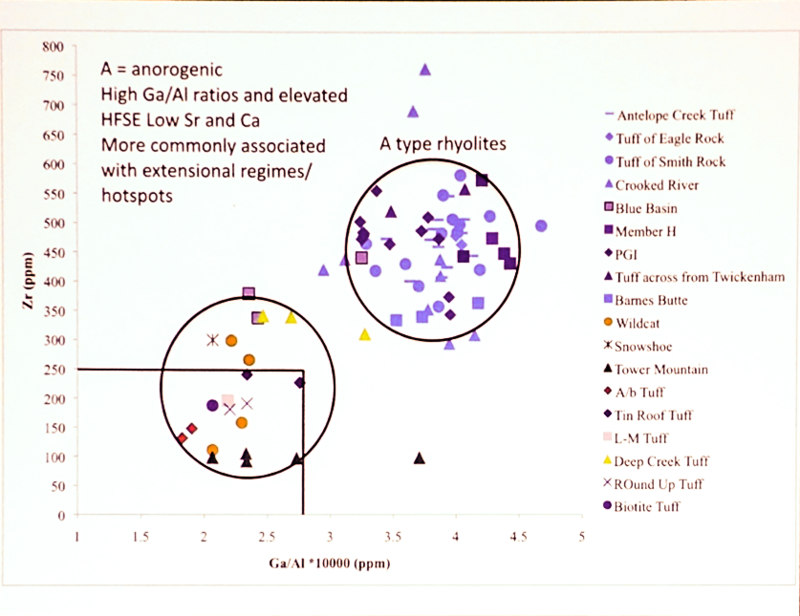 The Crooked River Caldera samples were a geochemical match for the source, and furthermore were distinctly different in character than those of the others, being an A-type rhyolite. One of Karyn’s discrimination diagrams clearly shows the Crooked River Caldera magma source as being different from the other volcanoes in the region at that time. Note that outcrops of Picture Gorge Ignimbrite belong with the Crooked River group. Photo by author. She plotted her findings on several discrimination diagrams. A-type rhyolites are not related to subduction signatures. Wildcat Mountain, Tower Mountain and the others were related or more related to subduction regimes. Crooked River Caldera signatures were markedly different. So, even though the Crooked River Caldera was erupting at the same time as Tower Mountain, one had a source more related to the subduction zone and the was more related to the hot spot vulcanism. Wildcat Mountain erupted much earlier and was also sourced in subduction zone derived magma. Dennis Chamberlin broke out his drone and took this spectacular shot of the Picture Gorge Basalt dike near Kimberly. Photo by Dennis Chamberlin. Paul makes an announcement from a piece of Goose Rock in the parking lot of the Foree area. Photo by author. 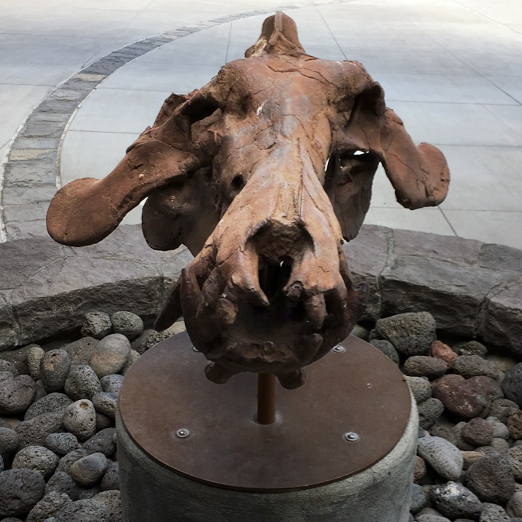 Fossil cast of “Terminator Pig” skull outside the Thomas Condon Museum. Photo by author. Last stop at the Mascall Overlook near Picture Gorge. Photo by author.